The Finn Halls were a place not just for socializing, but for political activities. The Iron Range mining strikes were organized in the Finn halls. The halls were just one part of the immigrant society Finns built for themselves. There were Finnish language newspapers like the socialist Tyomies, Finnish for "Working Man." and a region wide system of cooperative stores serving Finnish immigrants. Walter Harju, a leader in the Finnish cooperative movement, remembers. When they first started to organize, John Numivori had a little cubby hole in the Tyomies building where he had some samples of coffee and things of that kind, and he would make arrangements with the wholesale houses to get discounts. One of the problems was to get commodities to these people. They couldn't even get them from the stores. They were boycotted. And much of the difficulty came from not being able to get credit - any credit - and when you go on a stump farm you haven't got available money all the time, so they needed those cooperatives. The Finnish cooperative movement grew into the largest working retail cooperative in the country, lasting into the 1960s, when it finally gave way to big chain stores. Although it was eventually split by political differences, in its early years, the movement was unabashedly left-wing, as a glance at the goods lining the shelves showed. They had the red star, the blue star, and the yellow star and all of them had a sickle and hammer. The Central Cooperative Exchange truck had a big sickle and hammer on its side of the truck when it drove around Duluth and Superior. This was when the co-op movement was most successful. It created unity. It wasn't only to get a can of beans. Finnish women played a major role in organizing the co-op movement, the newspapers, and Finn Halls. Many Finnish immigrant women had come to America on their own, to work in boarding houses or as domestic servants. Their independence and self-reliance was nurtured back home in Finland. Women in Finland had been the first in the world to win full voting rights and citizenship in 1909, 11 years before American women won the right to vote. In this country, Finnish immigrant women were active in the suffrage movement. In Duluth, they tried to organize a union of domestic workers and published a daily radical feminist newspaper. Not all Finns were radicals, of course. Some were deeply religious and socially conservative - the so-called White Finns. But it was the radical or Red Finns who drew the most attention. Finnish immigrants were the first in the nation to found a foreign-language group of the American Socialist Party. Finntown in Virginia had a three-story brick building known as the Socialist Opera. By one estimate, a third of the Finns on the Iron Range in 1913 were socialists. In the 1930s, 40 percent of the total membership of the American communist party nationwide came from one small immigrant group - the Finns. Gus Hall, the longtime head of the American Communist party, came from a Finnish farmstead on the Iron Range. Andy Johnson, the boy whose family took the train to Aurora and homesteaded in the wilderness, grew up to be a well known local communist. One time - and I'm a fourth generation Finnish American - I said to my father, "Well, us Finlanders..." and my Dad said "Marianne, you can't say that. That's a racist remark, that's a putdown of the worst variety." After the 1907 strike, they tried to make the Finns be seen as Asians. There was an Asian exclusion act, and if the Finns could be seen as Asians, they could get them kicked out of the country. In 1908, Federal authorities tried to use the act to deny citizenship to 16 Finnish men. 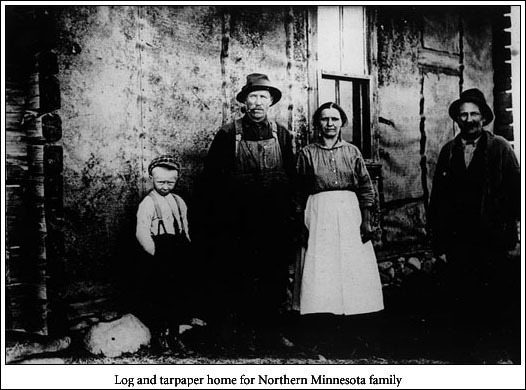 A Duluth judge ruled in favor of the Finns; in keeping with the racist tenor of the times, he wrote that Finns had white skins and thus could not be denied citizenship. But the case's echoes lingered for years. Will Sandstrom's family moved from northern Minnesota to Duluth during World War II, when he was about 9 years old. We lived in what was then called Finntown. There were other parts of town where Norwegians and Swedes lived. I remember my name was Sandstrom and this other fellow's name was Carlson, and we were white, blond as blond could be, and the Swedes, because they knew our parents, grandparents were from Finland, they'd go and put their fingers by their eyes and make slanty eyes and say "Hey, China Swede, hey China Swedes." "China Swede" was one term, "roundhead" was another. There were also more subtle forms of discrimination. Sometimes, Finns were looked down on simply because they were poor. Lillie Marie Maki Isaccson, the little girl who marched in the mining strike parade in Biwabik, remembers how her teacher humiliated her for having chapped, work-worn hands. I was sitting in the last seat in the row, and she would come by me and take my hands and say, 'Dirty hands!' and she said 'Tell your mother to put cold cream on them,' and I said, 'We don't have cold cream.' 'Well, tell her to put vaseline.' I said 'We don't even have vaseline.' And then she put a sign on my back: 'This girl has dirty hands,' and I had to go into the other room, and I stood in the hall and cried. Some of those hurts, getting Americanized, huh? Kaleva Hall, a quaint, old-world brick building in what was once Virginia's Finntown, sits at the edge of a played-out open-pit iron mine. In the basement of the old Finn hall, older men and women are having coffee and pulla - Finnish cardamom bread. The women sing an old Finnish lullaby. The knights and ladies of Kaleva, as they're known, are social groups dedicated to preserving Finnish culture. They cherish their grandmothers' old-country recipes; the hardships and poverty their grandmothers endured are a distant memory. Finnish Americans are now comfortably settled in the middle class. Unions ended the exploitation of mine workers. The futile attempt to turn cut-over timberland on the Iron Range into flourishing farm fields was abandoned decades ago as Finns found better opportunities elsewhere. Some say Minnesota's progressive political tradition is due in part to the radical politics of the Finns, but the Finnish radical movement is long gone, along with the deep economic injustices that spurred it in the first place. 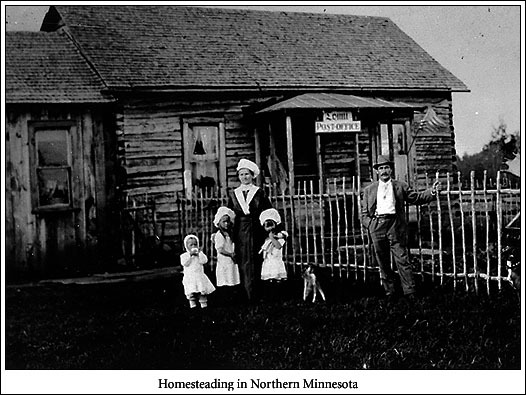 The story of the Finnish immigrants on Minnesota's Iron Range is unique in time and place. But the themes - exploitation, discrimination and the fight for acceptance by a wider society - are universal. If the past is a guide, the Vietnamese and Hmong and Somalis and others who are trying to find a new home here can take some hope from the experience of the Finns. For the rest of us, it is a reminder we are a nation of immigrants with separate pasts and a common future.